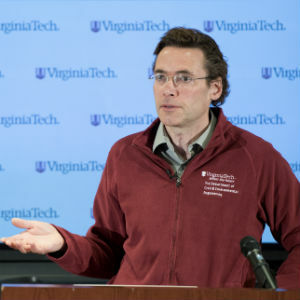 Virginia Tech’s Marc Edwards and hero-mom Lee-Anne Walters, who helped bring international attention to the lead-in-water and legionella contamination in Flint, Michigan, will be honored as 2016 American Ingenuity Award winners by Smithsonian magazine. Edwards and Walters earned the award in the magazine’s social progress category. It will be presented at a ceremony Dec. 8. The magazine presents the prizes annually in nine categories: technology, performing arts, visual arts, life and physical sciences, education, history, social progress and youth achievement. This year’s winners also include: comedian Aziz Ansari; Jeff Bezos, who founded Amazon.com; archaeologist Sarah Parcak, who finds ancient sites using satellites; Christopher Gray, whose Scholly app matches students to scholarships; OK Go, Damian Kulash, and Trish Sie, who redefined music videos; and director David Lynch, who is bringing meditation to inner-city schools. Edwards is the Charles P. Lunsford Professor of Civil and Environmental Engineering at Virginia Tech and a nationally renowned expert on municipal water quality. In 2007, Edwards was named a MacArthur Fellow because of his work in ensuring the safety of drinking water and in exposing problems with deteriorating water-delivery infrastructure in America’s largest cities. Last year, Edwards become involved in Flint when resident Walters reached out to him regarding the quality and safety of her tap water after her children suffered elevated blood lead and rashes. After testing with Virginia Tech, Walters learned that her tap water had extremely high levels of lead. In collaboration with other Flint residents and American Civil Liberties Union of Michigan, Edwards and a team of 17 Virginia Tech students and researchers conducted a comprehensive city-wide sampling effort of 277 homes last fall. The team concluded that Flint’s water suffered from serious lead contamination as well as bacteria problems, including Legionella. Flint pediatrician Dr. Mona Hanna-Attisha, Miguel Del Toral of the Environmental Protection Agency, Virginia Tech Professor Amy Pruden, and many others help bring attention to the dangers facing Flint residents. Two additional rounds of testing by Flint residents and Virginia Tech’s team revealed decreasing lead levels, though some samples were still well over the U.S. EPA’s designated action level of 15 ppb. A new team of Virginia Tech students arrived in Flint this week for a fourth and possibly final round of testing for lead in the water supply. Walters will again lead this sampling effort, which is funded by U.S. Environmental Protection Agency Region 5.